So there I was, Wednesday morning, debating which of my two gyms to go to for my workout. 24 Hour Fitness in Simi, with the awesome pool? 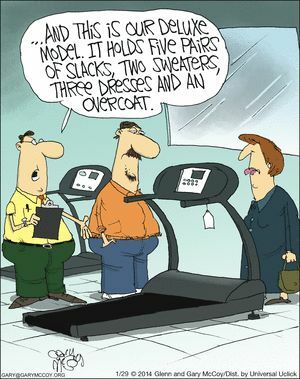 Or the equally awesome Anytime Fitness Chatsworth, with the super-fun video treadmills? I was at a crossroads (literally! Roscoe and Valley Circle, for you fellow Valley-ites). I had to decide NOW: right turn for Chatsworth, or straight ahead for Simi? Yeah, I really did. And there was LITERALLY no time to get to EITHER gym! “Literally” literally, man! But then — aha! — I remembered that there was some sort of historical nature park with clean, easy to access restrooms, LITERALLY right around the corner! And so, Wednesday morning, instead of the comfort of the gym, I opted instead for the “cheap showiness of nature” … and enjoyed every minute of it! The gyms will still be there when I want them. But it’s nice to know this will be, too! Well, it took me a little longer than usual to haul my a$$ out of bed this morning, so I’m temporarily abandoning the “Friday Five” format. Just for today, how’s about I tell you what my week has been like? So far, so good. My weight is still hovering around the 200 mark, in spite of the fact that I’ve been indulging in all those yummy goodies that were forbidden during Lent. Some more so than others (Frigo Cheese Heads Light String Cheese, I’m lookin’ at YOU!). But overall, I’m keeping the calories more or less under control! And it was on Fox News, so you know it HAS to be true! So anyway — between the long, leisurely, calorie-burning baths, and an increase in the number of weekly visits to the gym (which I still hate, but can tolerate), I figure I can hold my own till the Amazon drone drops my my new, comfy shoes onto the roof sometime next week. Meanwhile, I’m heading out today to enjoy the sunshine! Hope your weekend is a good ‘un. See you Monday for the weigh-in!